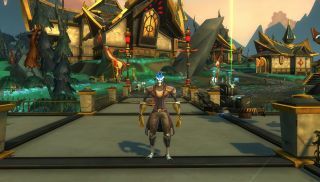 After a head-start period that began last Saturday, Wildstar officially launches today. Phil's review of the game will be published following at least a week of play on the game's live servers. In the meantime, this 'review in progress' will document his experiences with the game as they happen. Find the first part below. As I write this, I'm over 14 hours and 13 levels into Wildstar. I'm enjoying myself, for reasons that I'll go into later in these initial impressions. The reason I'm telling you this upfront is because I'll be recounting my experiences chronologically, and that means starting with the server queues. The pre-launch head-start weekend wouldn't trouble the worst of MMO launches, but it also hasn't been entirely smooth. Questions asked of the advice chat room are regularly answered with "the quest is bugged", an account inventory glitch resulted in a pre-order inventory bag being removed each session (along with any items inside of it), and people trying to access the more heavily populated servers were forecast an up-to-two-hour wait. That the estimate was often inaccurate—my queues lasting no more than a half hour—meant the problem was rarely as bad as it seemed. But it's hard not to assume at least part of that alleviation was down to other people thinking "two hours? Sod that." Late on Sunday, new servers were introduced, and since then I've been able to instantly access my EU realm of Eko. Alongside fixes for some of the more damaging bugs, it puts Wildstar in a strong position for today's launch, but that could be undone with the potential influx of new players for the official release. PC Gamer's Wildstar guild are playing as Dominion, so I resign myself to a lifetime of evil and pomposity. It's while idly clicking the different options that I'm made aware of the game's extremely caricatured proportions. The character design fits well in the context of the game proper, but it comes at the expense of personal preference. There are outliers, but, broadly speaking, the men sport big muscles and large chests, while the women fashion tiny waists and, well, also large chests. Here's an example from the Exile's hulking Granok race. That's not me carefully selecting body types to exaggerate the difference. In fact, it's the opposite: the lithest of the rock-men body types next to the bulkiest of the women. To be clear, it's not the existence of the extremes that bothers me—as I say, it works in the context of the game—but rather a lack of meaningful choice in a genre where character appearance is such an integral part of the appeal. I've got over 400 hours logged with my Guild Wars 2 Thief, so I go into Wildstar with a pretty good idea of the class I'm going to pick. It's a toss-up between the Spellslinger and Stalker, both of which are nimble, primarily DPS classes. I also want to be a robot, because robots. It's this last point that makes my class choice for me. The Mechari race is incapable of spellcasting, and so it's the stealth 'n stabs of the Stalker that win out. I also select a path—the profession-type that dictates what side-objectives appear as you're questing through the world. Dominion characters first spawn on the off-world ship Destiny, before moving onto the starter zone at Levian Bay. The opening is a broad mix of extremely simple quest-types designed to familiarise players with the game and its systems. It's here I get a brief introduction to combat, and learn of the conflict at the centre of the plot. That plot is told sparingly, a couple of sentences at a time, by each of the primary quest givers. The Dominion have travelled to Nexus to recover and study the technology of the Eldan—the ancient race that first established the faction. The early missions revolve around Artemis Zin, a famed explorer and egotistical celebrity. Her plan is to unlock the Eldar Cube, gaining the wisdom of the Eldan. Naturally, it all goes wrong. And of course that's accompanied by an announcer saying something along the lines of, "oh s***, you levelled up Cupcake". Wildstar also feels comfortable in how obviously inspired by World of Warcraft it is. That's nothing new—most MMOs since have borrowed liberally from the systems and structure exemplified by Blizzard. But I always felt that even The Old Republic seemed slightly ashamed by the comparison, as if it hoped people wouldn't notice the similarities. Less apparent in its DNA are the lessons of Guild Wars 2. It manifests in subtle ways, but things like the absence of a "sell all junk" option at shops are sorely missed. Luckily, Wildstar supports user made add-ons, and the community has already smoothed away such antiquated annoyances. By the end of Levian Bay, I'm getting a basic feel for combat. It's this that seems to make Wildstar stand apart from its rivals. The fighting is almost as fast and fluid as Guild Wars 2, but has the advantage of a direct-attack system that contains no tab-targetting. Attacks are still hotbar driven, but even my Stalker's basic melee swipe sends an AOE telegraph that needs to be aimed at my enemies. After a few levels, I'm able to stealth-sneak to my target, hit them with a backstab, and use a basic stun move to reposition behind them for a follow-up.